Chad, a landlocked country right in the heart of Africa, gets her name from Lake Chad, which means “large expanse of water.” This lake is located on the western border of the country and serves as a fresh water source to 30 million people in several countries including, Cameroon, Nigeria, and Niger. Chad also shares borders with Libya to the north, Sudan to the east and Central African Republic to the south. The people are called Chadians and the country is home to 200 ethnic groups. One can imagine with so much ethnic diversity, the native music, dance and traditions are rich and distinctive. The official languages are French and Arabic although hundreds of other indigenous languages are also spoken. The north, east and center of the country are home to nomadic groups that graze their livestock across large swaths of land. This area of the country is harsh and known as the Saharan North; a desert climate that gets very little rainfall and has temperatures ranging from 90 degrees Fahrenheit in the winter to an average of 113 degrees in the summer. Islam is the majority religion and widely practiced among these nomadic groups. It was brought to them by Arab traders and merchants dating back to the 11th century. In 2002, an important discovery was made in Chad in the study of evolution. A hominid skull was found and dated to be seven million years old; the oldest discovery made anywhere in the world. Also discovered there are the “round head” rock paintings that depict images of man and creatures from the early beginnings of evolution. About half of the population lives in the fertile, tropical, south part of Chad. The country was previously a French Colony and the French invested most of their resources in this southern area where many converted to Christianity. 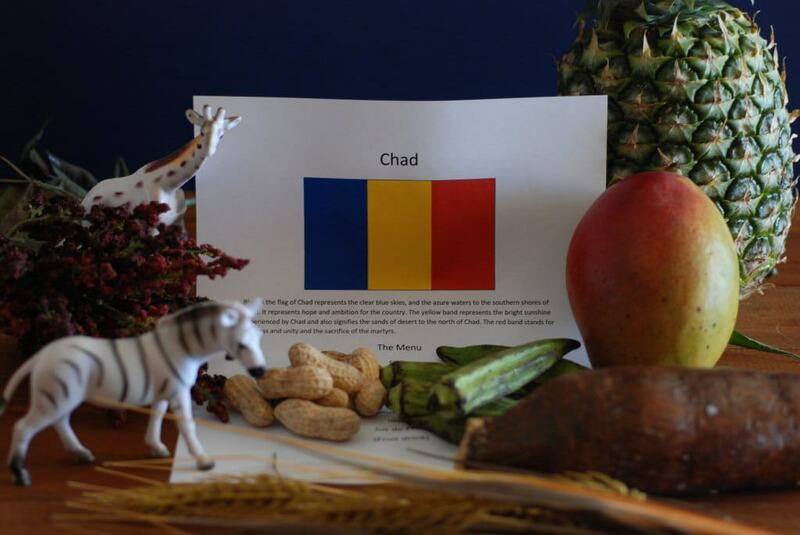 Chad gained independence from France in 1960. Since independence, Chad like many other countries in this area of Africa has suffered from ethnic divide and conflict, especially between the north and south. Today Chad is one of the poorest nations on earth, with over 60 percent of the population living in poverty. The literacy rate is a sad 26 percent and life expectancy is only 50 years of age. The capital city N’Djamena is a relatively new city, founded by the French in 1900. It suffered tremendous damage during the years of civil war and has seen a huge influx of refugees from surrounding countries. You may remember hearing in the news of the Darfur province in Sudan, from there Chad took in 200,000 Sudanese refugees. Then a recent flood of refugees trying to escape the atrocities in Central African Republic fled to Chad. Although the city tries to accommodate the refugees, they unfortunately don’t have the proper infrastructure to support such an influx and must resort to massive tented camps which have their own set of issues. Another major problem for Chad is their disappearing lake. The United Nations’ Food and Agriculture organization calls the situation an “ecological catastrophe”. The lake’s water level has shrunk by more than 90 percent from what it was in 1960; from 25,000 square kilometers to 1350 square kilometers today. This diminishing, life supporting resource has led to a humanitarian crisis and created massive social conflicts in the area. The World Bank and other organizations are looking into how best to support the government in dealing with this crisis as the desert continues to encroach on what was once one of Africa’s largest body of water. The problem is blamed on climate changes, increasing the evaporation rates and population growth. Agriculture and animal husbandry employs 85 percent of the population. Cotton, introduced by the French, along with cattle and gum Arabic, provide most of Chad’s export revenue. Chad is the second largest producer of gum Arabic, which is tapped by small scale harvesters from wild acacia trees throughout the Sahel region. Gum Arabic is exported mainly to the USA and Europe and is used in soft drinks, pharmaceuticals and many other products. Farmers, mainly in the south, produce several subsistence crops for domestic consumption. These include grains, oilseeds (like groundnuts, peanuts and sesame), tubers, and leafy vegetables. Millet and sorghum are major staples in the Chadian diet along with tubers, manioc and sweet potatoes. The grains are used to produce bili-bili and arghi, two popular alcoholic drinks in the south. 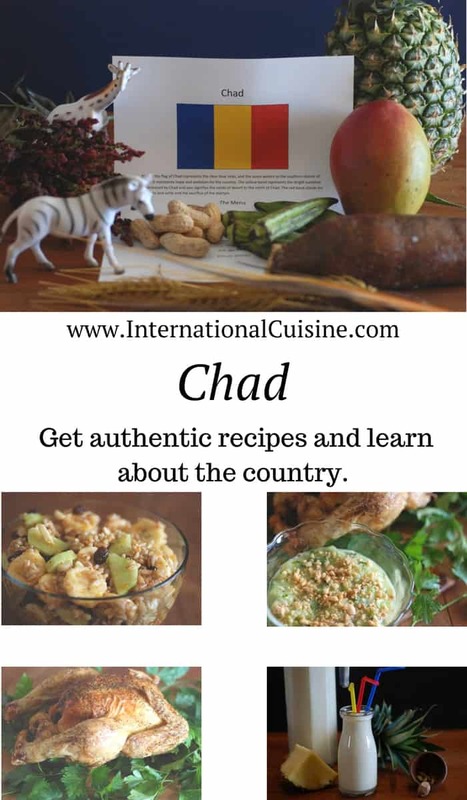 The cuisine in Chad is quite different from the north to the south. Fish are abundant around the areas of Lake Chad. In the North, the nomadic Arabs rely upon foods from livestock, mainly dairy products. Southern Chadians have many more options, especially near the capital city where there is subsistence farming. For our Chadian meal we set a mat on the floor with colors of the flag; blue, red and yellow. 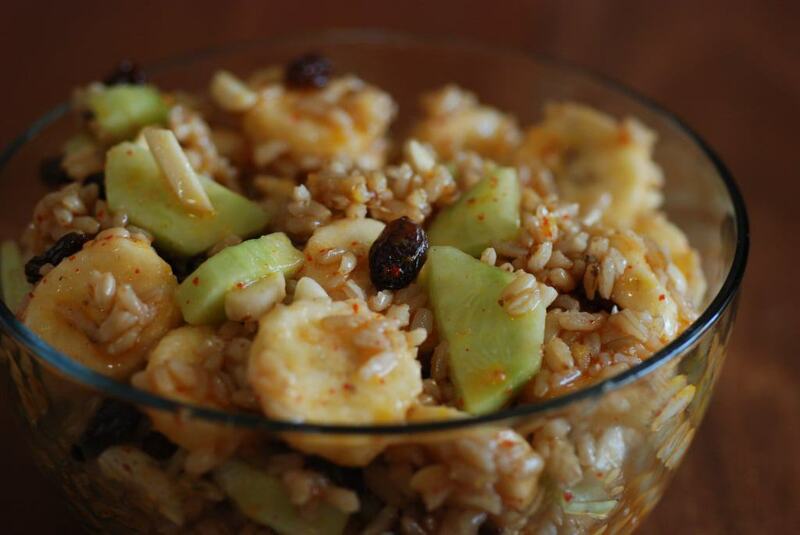 We began the meal with a delicious, healthful salad that clearly had an Arabic influence, with rice, raisins, bananas, cucumber, almonds and a hint of spice, lemon and honey. 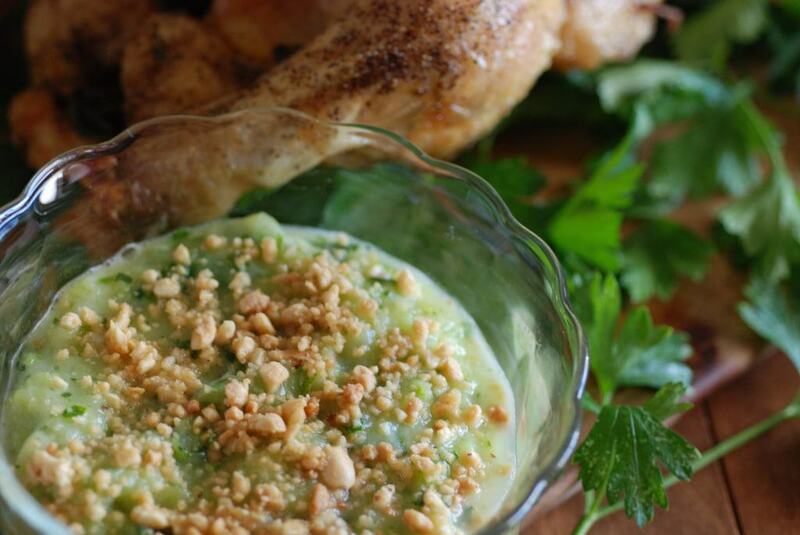 For the main course we enjoyed the Chadian-style, roasted chicken with mashed zucchini and peanuts. Honestly, I had never thought about mashing zucchini before and it was superb. (When our garden is in full bloom, zucchini is always in abundance. We are constantly looking for new ways to enjoy them, so thank you Chad!) 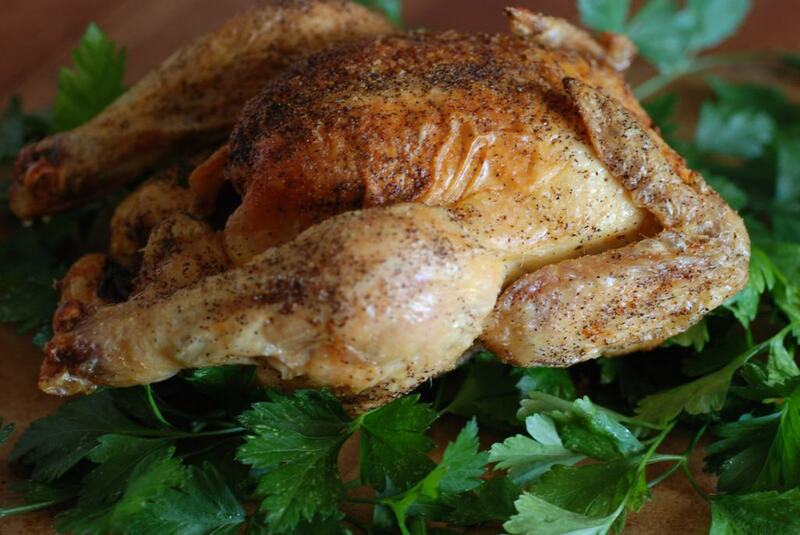 The chicken was perfect; light, crispy skin on the outside and succulent and tender meat on the inside. 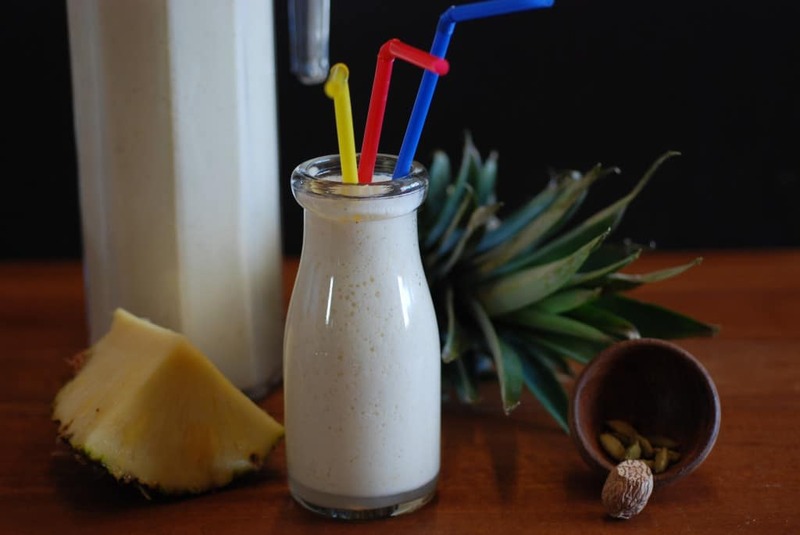 For dessert we enjoyed a simple drink made of pineapple, mango and milk, flavored with some cardamom and nutmeg. This drink, called Jus de Fruit, is sold by vendors on almost any street corner in the city. One can appreciate the cool refreshment it imparts on a sweltering, African, summer day. It would be customary to eat with only your right hand in Chad. You likely would sit on a mat on the floor and you must make certain that your feet don’t point at anyone or at the food. It is best to tuck them away to the side, if possible. Also, never give eggs to children. It is taboo in Chad to do so, as they believe it will cause their child to grow up to be a thief! As we say goodbye to this country called Chad, I can’t help but look for some hope for this poor nation. As it turns out, it may be oil. They have completed a pipeline across Chad to transport oil through Cameroon. Although the price per barrel of oil has plummeted recently, we can only hope that it will serve to provide a revenue source to improve the lives of the people who call Chad their home. If you always walk down the same path, you’ll go where you’ve already been. Your heart must be peaceful to hear song in the leaves of the trees.